To differentiate their product from the competition, communicating the results of scientific studies is crucial for pharmaceutical and biotech companies. Their MSLs need effective tools in order to be able to engage health care professionals in a meaningful dialogue. 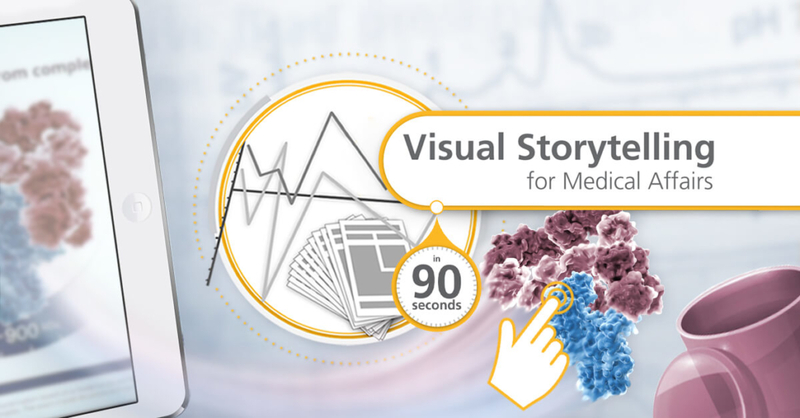 Instead of relying on text-heavy documents, MSLs should be empowered to tell a convincing visual story. The most important result of this particular study was that the proteins in the competitor’s agent were not required for drug activity. So, why not chuck them in the garbage in spectacular fashion? The appealing depiction of the interactive 3D molecule supports the MSL in initiating a conversation with the healthcare professional. Tapping on the proteins brings up information about their structure, weight, and lack of therapeutic effect. And the MSL can drag them, one by one, into the garbage can at the bottom to emphasize how disposable these proteins really are. Or, better still, they can encourage healthcare professionals to do it themselves. If this does not immediately start a conversation about the benefits of the purified molecule, nothing will.